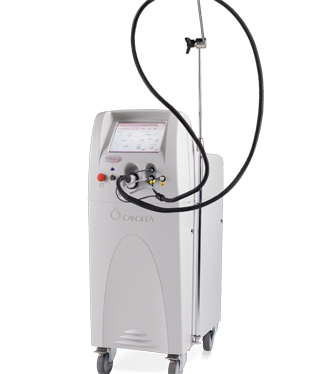 The best pulsed dye laser designed to treat benign vascular lesions. The intense pulse of yellow light from this laser selectively destroy small blood vessels of the under layer (dermis) of skin without damaging the surrounding healthy tissue or the epidermis. Vbeam laser also can be safely used during pregnancy, and can effectively treat the following indications: Facial and body telangiectasia (rosacea, sun-induced, etc. ), facial erythema, red or raised scars, red stretch marks, port wine stains, venous lakes (lips), warts, hemangiomas, flushing and spider nevi. A single session is usually sufficient for treating small veins, while other types of lesions (such as scars) may require more sessions for gradual clearing of the treated area. Vbeam laser can also be done in conjunction with PDT treatment to further improve red acne blemishes. No anesthetic required, patient will experience a slight discomfort like burning or snapping sensation. No down time: Patient can resume normal daily activities after the treatment with suitable sun protection (sunscreen with SPF 30 to 45); occasionally swelling and itchiness can occur after treatment. Rarely, a blue-grey discoloration may appear and can last from 3 – 12 days; or a temporary “bronzing” of skin my occur from iron being deposited in the skin, but will clear up in 1 – 3 months.